Well before we learned Reykjavík was a sister city of Seattle, we’ve been extremely fond of the Northern capital. Sure some of this has to do with the time we’ve spent in and the personal ties we have to Scandinavia, but ultimately we’re drawn to the Icelandic capital because of the natural beauty of the place and the spirit of its people. As it turns out, the spirit is one that is often best expressed musically. 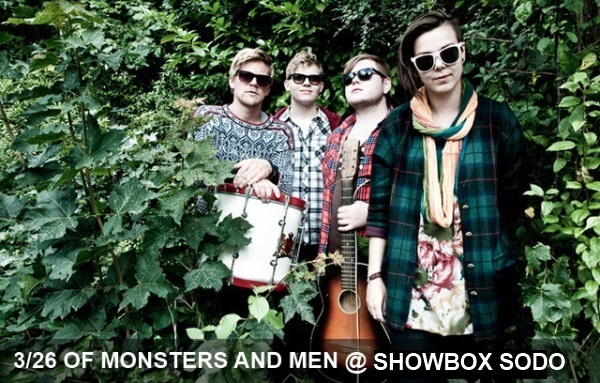 Tonight’s Showbox SoDo headliners, Of Monsters and Men are yet another example of Northern Europe’s musical skill. The young Icelandic six-piece couples orchestral instrumentation with emotive, often intertwining vocals to great effect in joyful ways that often make listening to the band feel like you’re listening to a female-fronted Edward Sharpe and the Magnetic Zeroes or perhaps a more expansive The Head and the Heart. If you’re a fan of what you’ve heard so far, be sure to head down to Showbox SoDo for the live experience.